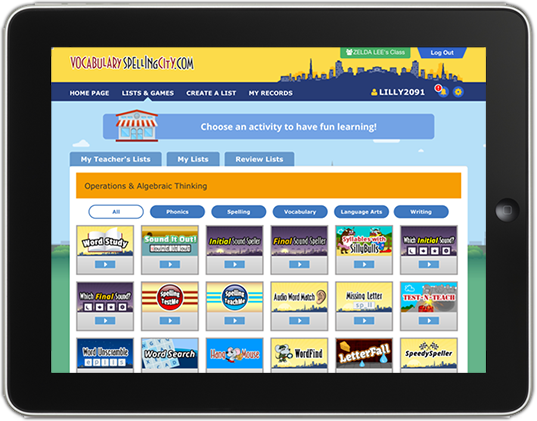 VocabularySpellingCity offers apps for use on Apple and Android devices. Apps for Apple devices may be downloaded to your iPad, iPhone or iPod Touch from the App Store. Apps for Android devices are available from the Google Play Store. Access to the full features of the app is limited to VocabularySpellingCity Premium Members. Premium Members can log in through the apps for easy access to their lists! Students of Premium Members can complete their Assignments through the app, and parents and teachers also have easy access to their students’ records from the app by selecting the My Records link in the navigation bar. How can I tell if the VocabularySpellingCity app is going to work on my device? The information page for each app (in the App Store, and Google Play Store) includes information on system requirements. Please refer to these before downloading the app. Is the app available offline? A wi-fi or mobile data connection to the internet is required to complete activities and save activity and assignment progress while using the app. How do I rate or review the app? Once you’ve downloaded the VocabularySpellingCity app to your Apple Device, log into your iTunes account and go to our app page in iTunes to rate and review the app. Android users can also rate the app directly through the Google Play Store (when logged in). We appreciate your feedback!